Located in Capitol Hill’s Pike/Pine Corridor, the Pike Lofts is a sought after place to live. Its location provides an easy walk to downtown, the Pike Place Market and Broadway. Additionally, residents enjoy a plethora of retail shops, eateries, coffee houses, clubs and recreation. 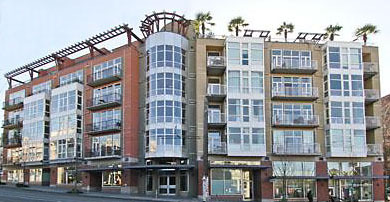 Completed in 1998, the building offers 61 Seattle-style lofts, 1-bedroom and 2-bedroom penthouses. Features include floor-to-ceiling windows, high ceilings and granite counter tops. There is a small community roof-top deck for residents Seattle skyline views. The units on Pike, while offering nice city views, is above a busy street with bus traffic and a bar right across the street, so it can be a bit noisy. The units on the backside are far more quieter. For the most part, prices are reasonable and there’s been relatively little turn over.